A cleaned premium-grade thistle that has been sterilized to prevent germination. Guaranteed Analysis: Crude Protein (Min), 16.0%Crude Fat (Min), 32.0 %Crude Fiber (Max), 16.0%Moisture (Max), 12.0%Ingredients: Niger Seed (Guizotia Abyssinica). 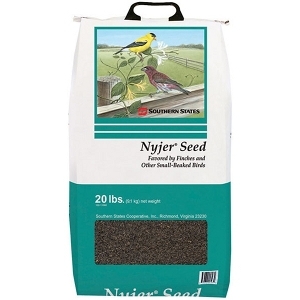 Features: Virtually dust-free, premium-grade Nyjer® Seed. High fat levels. All Natural *Nyjer® has been sterilized to help prevent germination. Nyjer® is a registered trademark of the Wild Bird Feeding Industry.